Preface: The World Heritage Youth Forum Declaration (2016), was adopted by the UNESCO World Heritage Youth Forum 2016 “At the Crossroads of Multi-layered Heritage”, Istanbul, Turkey, 29 June -12 July, 2016. 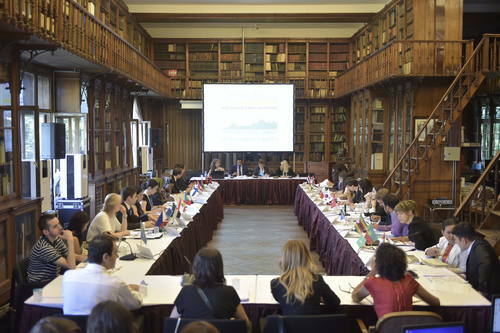 As part of the 40th session of the World Heritage Committee and in the framework of the UNESCO World Heritage Education Programme, the Turkish National Commission for UNESCO and the Istanbul Site Management Directorate are organizing the World Heritage Youth Forum 2016: “At the Crossroads of Multi-Layered Heritage” from 29 June to 12 July 2016. World Heritage Youth Forum 2016: “At the Crossroads of Multi-Layered Heritage”, from 29 June to 12 July 2016 in Istanbul Turkey. Young representatives, aged from 22 to 28, from 35 countries, had the opportunity to exchange ideas, contribute to the discussions and immerse themselves in topics within the scope of multi-layered heritage. Scheduled activities included: visits to World Heritage sites, including Bursa and Cumalıkızık, with the international heritage experts; workshops on different aspects emerging from the multi-layered sites; practical hands-on activities with timber and stone work for the protection and maintenance of the World Heritage site in Istanbul; experts and young representatives’ presentations; participation in discussions on the state of conservation of properties and practicing the Youth Model simulation. The young representatives prepared the final document of the Forum to be presented during the Opening Ceremony of the 40th World Heritage Committee Session. They will also participate in the first plenary day of the World Heritage Committee to observe how the Committee works. In order to provide an occasion for the young representatives to exchange ideas with the delegates we ensure the participation of the young representatives on the first plenary day, 11 July 2016. 29 June -12 July, 2016. The UNESCO World Heritage Youth Forum 2016 “At the Crossroads of Multi-layered Heritage”, Istanbul, Turkey, 29 June -12 July, 2016. The Declaration recalls that the links between tangible and intangible heritage should be strengthened to contribute to a better understanding of heritage. and the declaration appeals to the World Heritage Committee to establish a stronger inter-disciplinary bond between the Convention Concerning the Protection of the World Cultural and Natural Heritage (1972) and the Convention for the Safeguarding of the Intangible Cultural Heritage (2003). The Declaration emphasizes the significance of raising awareness concerning the multi-layered aspect of heritage sites as a concrete proof of the historical appreciation of civilizations influencing subsequent periods that continuously gives inspiration to a universal cultural evolution, of which Istanbul is a significant example. The Declaration strongly recommends participation of the youth in the decision-making process for heritage conservation and management in their respective States Parties, to allow them to develop their skills and acquire knowledge through collaboration with heritage experts. The Declaration further recommends that all subsequent World Heritage Youth Forum events must include visits to heritage sites related to the theme and discussions about its challenges and potentials in the corresponding Youth Model of the World Heritage Committee.